"If you carry a gun, people will call you paranoid. That's ridiculous. If I have a gun, what in the hell do I have to be paranoid for?" At the beginning of every concealed handgun class I teach, I take a few minutes to go around the room and allow students to introduce themselves and say as much (or as little) as they want about why they are taking the class. In addition to whatever else they share, it is quite common for students to note that while they are taking the class out of a desire for self-protection, they don't plan to carry regularly. At some point during the day, as I strive to drive the point home that a gun left at home is as useless as the umbrella they left behind on a rainy day, I always have at least one student ask, "So you carry all the time? Now, granted, part of this is likely due to the fact that I live in a rural area and many of my students have known and interacted with me for years outside of the classroom, not having any idea of the fact that I was carrying. But I find it interesting that while many of these same people wear seatbelts all the time, understanding that they can't know exactly when they might be involved in a collision, they aren't planning to apply this same strategy when it comes to carrying their concealed firearm. They'll just carry it, they reason, when think they might need it. This faulty logic has come to mind a lot over the past few weeks as I've came across two incidents in the Buckeye State involving persons being attacked while working outside in their yard. A 22-year-old Chillicothe man is accused of assaulting and robbing a man who was mowing his lawn. Jesse R. McKeever, 22, was arrested at about 3 p.m. Friday and charged with one count of aggravated robbery. McKeever, whose last known address was on Church Street, is in jail on a $50,000 bond. Timothy L. Woods called Chillicothe police to report the robbery at about 9:55 a.m. Tuesday. Officers responded to Woods' Church Street home and saw that Woods' face was injured and he was bleeding a lot. Woods told officers he didn't know the man who robbed him, but he had seen the same man earlier at a nearby store and later walking up and down the sidewalk in front of his house. Medics transported Woods to Adena Regional Medical Center for treatment. Marsili told sheriff's deputies he was doing yard work around 4:50 p.m. Sunday when Kendle came to the house with Angelina Flinn, the 9-year-old daughter of Kendle and Chrisie Marsili-Kendle. Kendle's girlfriend, Sarah Deters, 22, of 314 Grandview Ave., Tiltonsville, also was in the vehicle, the sheriff's department reported. Marsili, who has a valid firearm carry permit issued through the Belmont County Sheriff's Department, said Kendle threatened him, a deputy reported. Marsili said he was walking away when Kendle charged at him, the sheriff's department reported. Marsili said he pulled a .22-caliber Magnum revolver out of his pants but it didn't deter Kendle from coming at him, the sheriff's department reported. Abdalla said Marsili claims Kendle grabbed at his hand and the gun went off. The bullet hit Kendle in the right side of the chest and it nicked Kendle's aorta, the sheriff's department reported. "He (Marsili) is basically claiming self-defense. I'll be leaving it up to the prosecutor to decide what charges should be filed," Abdalla said. Abdalla noted Kendle didn't have a firearm when the two men began arguing. He did say Kendle is a much taller and heavier man than Marsili, and that Kendle had threatened to kill Marsili several times in the past. Flinn told a deputy she saw Marsili and Kendle arguing outside the house. She saw Marsili walking away and Kendle following, with Kendle grabbing Marsili, the sheriff's department reported. Flinn said she turned to go into the house and heard a gunshot, the sheriff's department reported. Deters told a deputy she saw the two men arguing, and saw Kendle take off his shirt and hat "as if they were going to fight." Deters said Marsili told Kendle several times to leave, while Marsili was walking away. She said she tried to step between the men but Kendle pushed her aside, the sheriff's department reported. Kendle then charged at Marsili and the gun went off, Deters said to a deputy. A witness told a deputy he heard Kendle in a "loud and threatening manner" arguing with Marsili. The witness said he heard Marsili about three to five times tell Kendle to leave, the sheriff's department reported. The witness said he saw Kendle take off his shirt, hat and glasses and attack Marsili, a deputy reported. Marsili was able to break free and one shot was fired, according to the witness. Clearly, all of the facts of this case are not yet known, and I will not presume to suggest that this was a "good shoot" or a "bad shoot." The prosecutor apparently believes self-defense with a deadly weapon was not warranted in this case - Marsili has been charged with one count of felonious assault with a gun specification. Whether or not this CHL-holder is found to have acted appropriately, these incidents clearly show that we cannot anticipate the time or the place when we might be faced with a violent attacker. The robbery victim in Chillicothe made no plans for this reality, while the Dillonvale man did. In Chillicothe the victim was seriously injured, but the Dillonvale man was not. Think you're safe working in your yard? Think you only need your sidearm when you're going to the "bad" part of town? Think again. The fact is, bad things happen to good people, and we do not get to chose the timing. People intuitively acknowledge this in other areas of life. They have insurance, seat belts, spare tires, and fire extinguishers, hoping to never need to use them. Why not have another tool that can be used for protection when things go very wrong? It is better to have a firearm with you and not need it than to need it and not have it. If you need it and don't have it, you might never need it again. 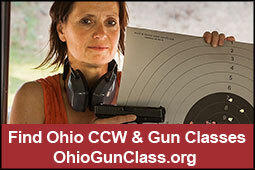 Chad D. Baus is the Buckeye Firearms Association Vice Chairman, and an NRA-certified firearms instructor.